This functionality helps you generate an Interactive Object which will be able to place objects in AR. 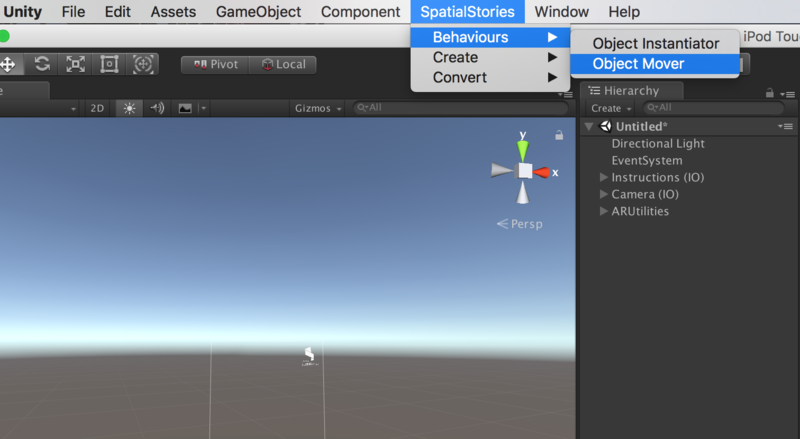 To create a Mover Behaviour, go to the top menu SpatialStories > Behaviours > Object Mover, like shown below. Then, the window to setup your behaviour will appear. Behaviour name: name that the generated IO will have. Objects to be moved: list of objects you need to move. Deactivate At Start will, if checked, deactivate all the objects specified in the list when you launch the application. It is useful when you don’t want to see objects that needs to be placed before it’s their turn to be placed. Otherwise, you will see all your objects in the list at start at their original position. IN_FRONT_OF_CAMERA at the specified distance in the devices’ screen forward direction. Generate Behaviour is used to generate the configured behaviour in your Hierarchy as an IO when you’re done. NOTE : A generated behaviour will have interactions already setup but you can notice that there are also two more interactions called Start and End. Those interactions are here to help you build dependencies with other Interactive Objects in your scene. To generate your IO, simply press Generate Behaviour (Warning: the behaviour window will remain open so check your hierarchy before pressing the button a second time).